Charles Thompson brings his experience in Business Management and Actuary Science to the Anchor Realty Florida team in Panama City Beach. Prior to joining Anchor Realty Florida, he attended Middle Tennessee State University, and worked as a management professional demanding strong organization, technical, and interpersonal skills; committed to superior customer service. His work in Actuary Science while working on a NASA Project to show the correlation of the Effective Cost of the Hubble Telescope taught him to be detail-oriented and resourceful. Charles’ success is due to his patient demeanor and dedicated work ethic which has helped make his transition to the real estate industry a seamless one. 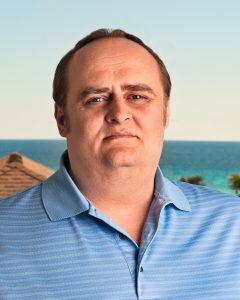 Focusing on the niche market of luxurious 30A and family-friendly destinations in Bay, Okaloosa, and Walton Counties; he most enjoys connecting with clients and guiding them through a major step in their lives – buying a house and making it their home. With the keen ability to listen and respond to his client’s needs, he’ll be there to help guide, educate, and provide the best service possible. His comfort level spans serving everyone from high-profile corporate clients to individuals and families. Raised in a small Tennessee town an hour from Nashville, Charles has been married to his high school sweetheart, Nicole, for almost 25 years and raised their four children – three sons and a daughter – all grown with exception to his youngest son in high school. After his family’s first vacation together in the Emerald Coast, he fell in love with the beautiful emerald waters and white sand beaches. Knowing that he wanted to live here and own his own beachfront home, he feels that others should be able to attain the same opportunity to own a piece of paradise. Whether he’s spending time with his family or coaching youth football as he’s done for 15 years, in his free time, you can find Charles watching or talking sports, deep sea fishing, coin collecting or investing. As an avid history buff, he also enjoys exploring and learning about the biography and backstories of the Emerald Coast and surrounding areas.